This week, I’d like to mention a remarkable product produced by a lovely Canadian husband and wife. First, let me forewarn that I do not generally gravitate toward the “all-natural” beauty product market. For skincare, I would rather buy more expensive products from reputable brands several times a year than have a whole arsenal of half-used drugstore wannabes. Clarins and La Mer are two of my favorite splurges (to be reviewed at a later date). I had never heard of Living Libations until I saw it on my best friend’s Instagram feed in January. Since I know she has super-sensitive skin and struggles to find the right products, I was instantly curious. Also, as a vegan, she has devoted considerable research into the organic and natural beauty market. I logged onto the website and literally spent hours reading descriptions and reviews for the wealth of the company’s available products. Everyone was raving! 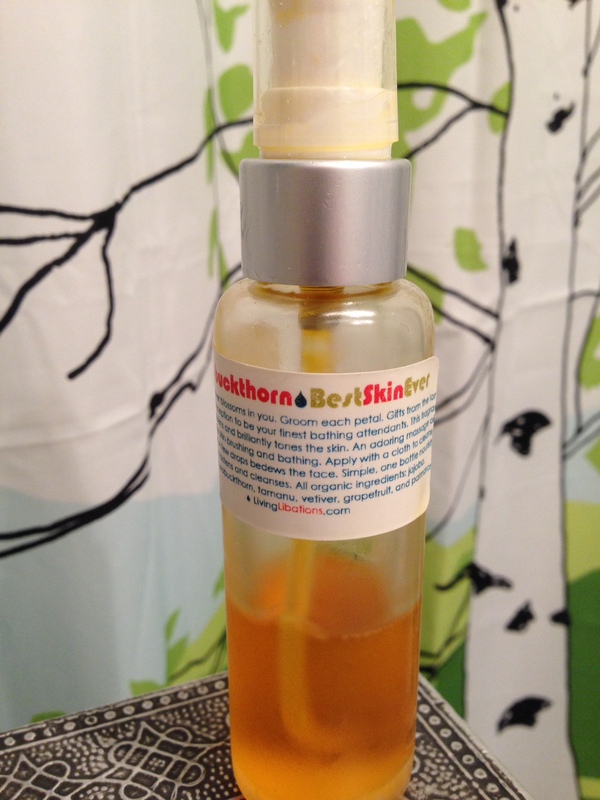 I ended up with six items in my cart, but ultimately narrowed it down to the most popular product – “Best Skin Ever” skin oil in Seabuckthorn (they have other fragrances like Rose, but I figured I’d start with the original). I try to avoid buying unnecessary products (or products that I can’t return). No one wants to be forced to throw something away or be reminded of their folly seeing it their medicine cabinet on a daily basis. As someone with naturally oily skin, I was fairly skeptical of the whole skin oil craze. Why do I need more oil on my face? However, after using this product, I was convinced. The oil naturally attracts and removes oil and dirt from your face, leaving behind a natural glow (never slick or greasy). It’s also a great moisturizer. I used it for a few weeks, then brought it home for my mom to try. She was so impressed that I sent her a bottle of her own. Heed her advice: “Once you find something that works, don’t switch. Beauty products are generally best when you develop consistency and use them over the long term.” I think Best Skin Ever is a new long-term love! AM: Wet face. Put 3-4 drops of Best Skin Ever on the corner of a damp facecloth, and massage over skin in circular motions to exfoliate and cleanse. Rinse and dry face, then continue with normal beauty routine (moisturizer, sunscreen, etc). AM & PM: Add 1-2 drops of Best Skin Ever to moisturizer and blend into skin. Let the happy glow commence! Every ingredient is good for your skin. The fragrance is light and beautiful. At $30.00, Best Skin Ever is at a similar price point to those found at Sephora (Josie Maran, Tarte, etc.). A little pricey to ship internationally. But since you are only using a few drops per day, the bottle lasts for a while. I now order multiple bottles and split them with my mom – problem solved!